Though the iPhone 6 is durable, it can still be susceptible to breaking. Broken iPhone 6 screens are not at all uncommon, and while they can seem to be only an aesthetic issue, getting them repaired immediately is essential. While a broken iPhone 6 screen may seem to not impair how well the iPhone 6 works, leaving a broken screen can lead to major problems down the road. If a broken iPhone 6 screen is left broken, moisture can seep in through the cracks and over time ruin the internal hardware. Not repairing your broken iPhone 6 screen could cause you to lose your phone entirely later on down the road. 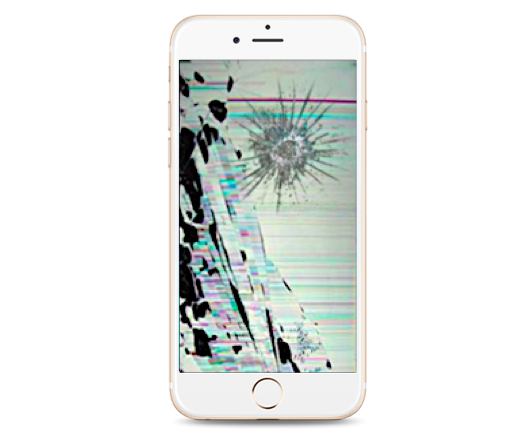 Broken iPhone 6 screens that are left un-repaired therefore have the potential to damage your iPhone beyond repair later on down the road. Moisture seepage through broken screens is something that can slowly accumulate over a number of months, until the internal hardware is water damaged. However, if you have a broken screen, this could be the least of your problems. With the constant use of our phones, daily moisture accumulation is only one side effect. Our phones are exposed to all kinds of moisture on a regular basis. Often, the bodies of water iPhones are exposed too are far larger than the small amount of moisture in the air. Things such as getting caught in the rain with your iPhone in your pocket will undoubtedly ruin your iPhone if you have a cracked screen. If your broken screen has been repaired, this would be no biggie, and is not likely to ruin the iPhone 6 as it has been proven to be quite water durable. If your screen is broken however, this exposure to water will ruin the internal hardware of your phone. At best, this will result in an expensive water damage repair - which are much more expensive than screen repairs. At worst, your iPhone could become damaged beyond repair, necessitating a replacement of the iPhone. Therefore, it only makes sense for iPhone 6 users to repair their screens as soon as they break. Leave it, and you be paying for an entirely new iPhone later down the road. If you have broken your iPhone 6 screen in Melbourne, please contact us for an iPhone 6 screen repair Melbourne. Fixspot is located in Melbourne's CBD and offers iPhone 6 screen repair Melbourne at an affordable rate. To see our iPhone 6 screen repair Melbourne prices, please click this link to see a full list of our iPhone 6 repairs and prices. Or visit us in store at Level 2 Unit 207 / 125 Swanston Street (Century Building) , Melbourne CBD , VIC 3000 to hand in your iPhone 6 screen repair Melbourne. Please see our Melbourne contact page for detailed instructions on how to find us. Alternatively, you can send us your iPhone 6 screen repair Melbourne into us by post. For more information on our repair by post service, please see our repair by post page. We accept repairs by post from all over Australia.